Cashing in on the kettle-cooked craze?, originally uploaded by Camemberu. 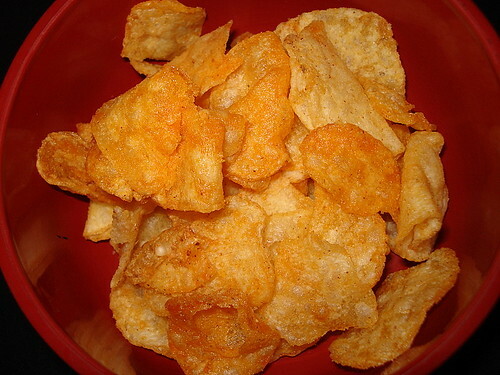 Frito-Lays has introduced a line of kettle-cooked chips, all with zero grams trans fat. I tried the Jalapeno ones. Nutritional info here. Kettle Cooked Lay's Fries - Jalapeno, originally uploaded by Camemberu. Extra crunchy they sure are. Not too bad, but still rather salty (as is typical of US snacks). However, they are less greasy and rock-hard than the KETTLE®Chips. I might try some other flavours from Lay's, hoping to find the Maui Onion ones. Where did you get these chips?? Hee.. I want to try too. foody, yeah I know but these are not so bad. didally, I think Cold Storage has them but not sure if all outlets stock them. I want to buy some more too...hehe. 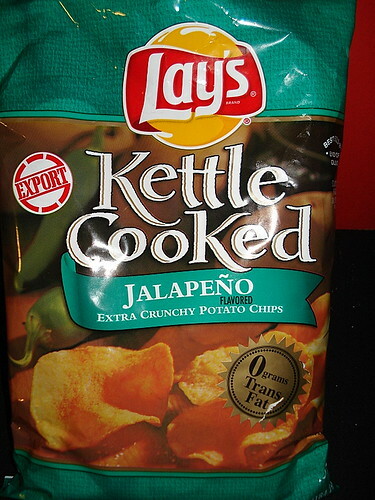 Oh I was just eating some Kettle chips...Hot Jalapeno ones. Not very good. I haven't seen the Lay's ones in ages.